Windows 7's ISO burning feature isn't all that useful for a majority of people, but for the small percentage who do need it, it's phenomenal. 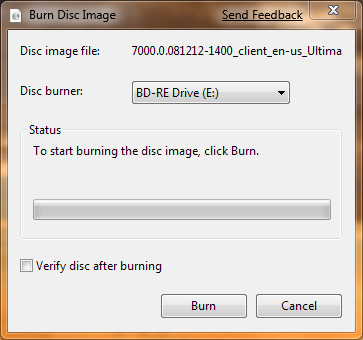 Just double click any .ISO image file (which are used to disseminate DVDs of operating systems on the internet, for example) and a utility will pop up, allowing you to burn a disc to your optical drive. For more sophisticated ISO types that people who regularly Torrent stuff would be familiar with, you'll still have to use other apps like Nero; but for easy Windows 7/Linux OS image burning, this works just fine.